Even though I have a big interest in history, I sometimes find reading it a bit of a chore. Or, at least, not the kind of thing that I want to rush back to. 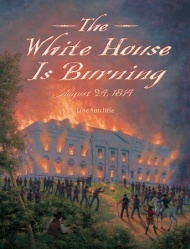 The White House Is Burning: August 24, 1814 by Jane Sutcliffe is not at all a chore to read, and I found myself looking forward to getting back to it. The book's publisher refers to The White House Is Burning as the "biography of a single day." That is how the book is structured. Sutcliffe takes readers through the day the city of Washington fell to the British during the War of 1812. She does that by using first person accounts. Fortunately a number of people who experienced the burning of the President's house felt moved to write down their thoughts. Note that the Introduction and the last chapter both begin with a reference to how the fall of Washington would be covered in the modern press. Nice frame. The White House Is Burning is a great read, but it's also lovely to look at. It's illustrated with beautiful period artwork and portraits of historical figures referred to in the narrative. Though this is what might be described as an over-sized book, don't mistake it for a picture book. This is 105 pages of full text accompanied by 7 pages of quotation credits and a 3 page bibliography. And there is an index. I mention all this because I've heard that some teachers in the upper elementary school grades have page requirements for books acceptable for projects. This book ought to meet them. I don't know how big a place The War of 1812 has in school curriculum. This book, though, is so marvelous a piece of work that it ought to be valuable in teaching how to read history and how history can be written. Disclosure: I've run into Jane Sutcliffe here and there over the years, and a few months ago, she joined my writers' group. I ordered this book through Interlibrary Loan. I'd hoped to include it in my "Friends' Books" 48-Hour Book Challenge, but it didn't arrive in time.